❖ What is Japan Heritage? What is the Western Capital? Many annual events of the Imperial Court were transferred to Dazaifu by senior government officials during the Heian period (794-1185), and they were conducted in front of Tenman-Tenjin deity. They were called Shido no En. Among these, Kyokusui no En with its origin in the continent, as well as Tanabata no En and Zankiku no En are still practiced today. At these events, poems including Chinese-style poems are created. 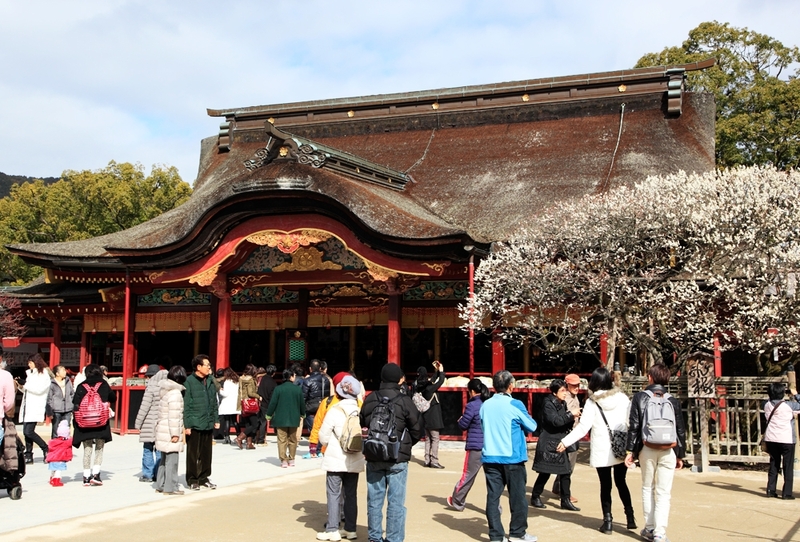 Every year on the first Sunday of March, Kyokusui-no-En Festival is held at the East Garden of Dazaifu Tenmangu Shrine. 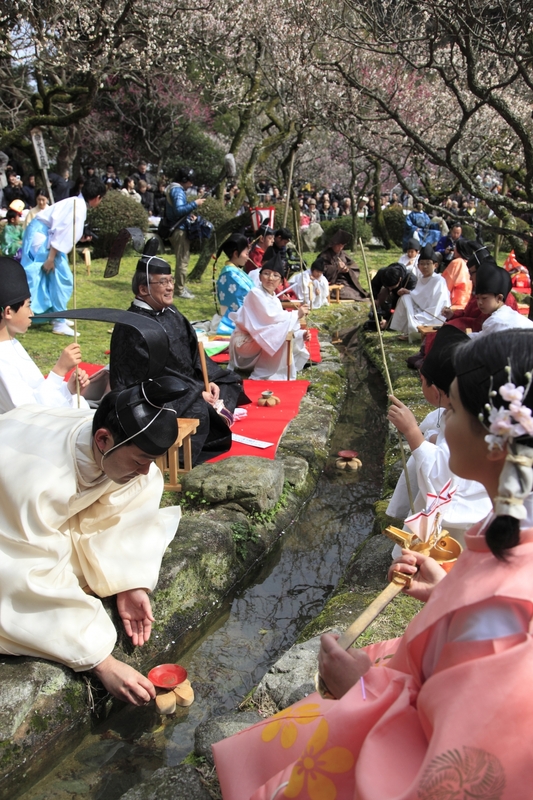 Kyokusui-no-En was started in China and it is believed that it started as a purification festival and for throwing sake cups in the river on lunar March 3rd. A famous one is that of Wang Xizhi who is known as a great master of calligraphy held at Rantei (in the Eastern Wei in China) in 353. In Dazaifu, a vice-governor of Dazaifu ONO no Yoshifuru started in 958. It stopped during medieval period but restarted in 1963. 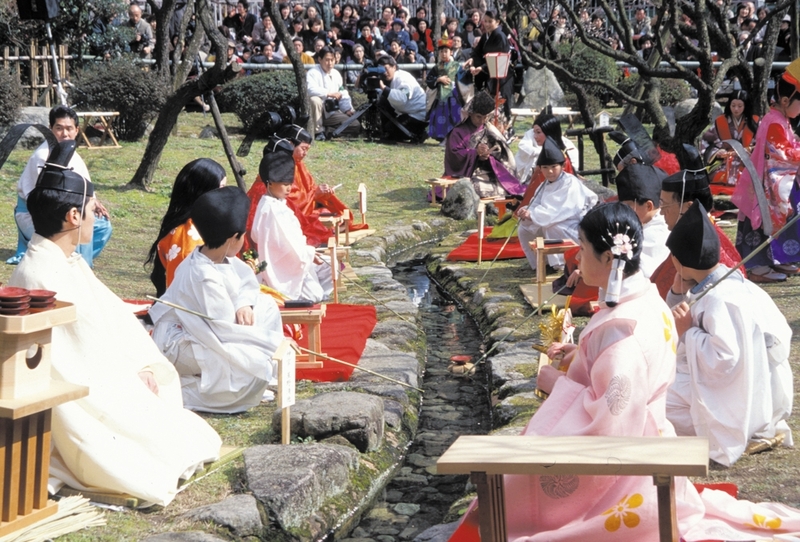 Poets wearing Heian Era costumes (such as ikan, the work clothes of the nobility and government officials at the imperial court, and the junihitoe, an extremely elegant and highly complex kimono) sit along the banks of the channel and compose a poem while a floating sake cup in the channel reaches them. This festival is a feature of the coming of spring. Dazaifu Tenmangu Shrine is a mausoleum worshiping Sugawara noMichizane. Michizane (845-903) showed a talent for poetry since he was a child, later he became “Monjo hakase” (professor of literature) who gave lectures to Emperor and Ministers. He was also an outstanding politician and finally became Udaijin (a rank of minister). In the year 901, he was falsely accused and convicted because of a plot against him and as a result he was demoted to Dazaifu. In February 25, 903, he died at age 59, in despair. His body was buried in Dazaifu at his wish. On the way to the burial place, a cow which was pulling a carriage with his body in it, when it suddenly stopped on the road. People wondered why the cow refused to move, so they buried the body at that location. This location later became Dazaifu Tenmangu Shrine. Since Michizane was an outstanding literati and scholar, he has been worshiped as a god of literature and study until now. ※Use of the application is free of charge, however, mobile packet charges for download or use may cost you. Copyright © 2016 Dazaifu City Japan Heritage Utilization Council<Dazaifu City Education Committee Department of Cultural Assets>. All Rights Reserved.